A group of grieving parents of the Chibok girls and relations of others abducted by Boko Haram insurgents on Sunday said they are tired of President Muhammadu Buhari's "empty promises to rescue those remaining in Boko Haram captivity" after 5 years. The founder of Jire Dole Network, Hamsatu Allamin, disclosed this while speaking at an event in Maiduguri, Borno state to commemorate the fifth year since the abduction of Chibok girls tagged #StopTargetingWomenAndGirls. She said government's inability to end the decade long insurgency has elongated the stay of the remaining Chibok girls in Boko Haram captivity. She urged the federal government to put an end to mass abduction of girls and women in the country and equally ensure the release of all those abducted by the insurgents. "Today, it is exactly 5 years when a total of 276 schoolgirls were forcefully taken away; although some have returned, some of 112 parents and relation of the abductees still live in misery, pains and losses. 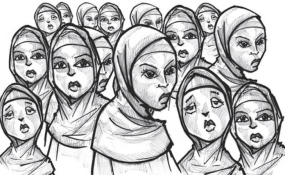 "That women and girls are abducted is still a fact with no end in sight, including the most recent when a number of women in the convoy of the governor's political campaign were ambushed between Dikwa and Ngala. "The bitter fact about it is that no mention, no acknowledgement is ever made not to talk attempting to secure their freedom. "We, the women of Borno, are raising this alarm now, saying 'If you want advance a society, target the women and if you want to destroy a society too, target the women.' We are indeed targeted," said Hamsatu. A parent and spokesperson for Parents of Abducted Chibokgirls Association, Mr. Ayuba Alamson lamented that APC-led government's promises have failed because they rode to power through the abduction of Chibok girls noting that they had forgotten. "We are still demanding the release of 112 Chibok girls plus Leah Shaibu, all together making 113 schoolgirls. We do not care about their status as many relatives have lost their lives due to constant thinking about these girls. "As I am speaking with you, 18 parents of these girls are late now as a result this abduction. "President Muhammadu should know that they rode to power by Chibok girls' abduction and he should make sure these girls must be released; enough of empty promises. "We have been living frustrated life for five years. Therefore, enough is enough; all we have been hearing is empty promises from the government. "What we are demanding now is immediate release of these girls, if they are our government, they should seek help from the international community and put an end to Boko Hara," Alamson said. One of the mothers of abducted girls, Yamta Rose, appealed to both the federal government and Boko Haram insurgents to release the remaining Chibok girls saying "we are dying inside." "Since my daughter was forcefully taken in 2014 in Chibok, I am walking but I am dying inside of me; although government were able to secure the release of some of them, my daughter is still with Boko Haram. "I am begging the government to try their best and release our daughters. Also, I am appealing to the Boko Haram to please free these girls. Even if our daughters have had children for them, we don't care, they should please release our daughters, because we are dying inside and our lives is on life support," Rose said tearfully.